And that's most definitely true for the Admin page. The Admin page has a very important role, but it's crucially important that this page is completely locked down and not accessible by non-authenticated users. If you see this or something similar on a live site, the administration page is wide open for anybody to access and that's a big problem. The page above comes from an actual site on the Internet and it makes me sad to see this, because you have to go out of your way to make this happen and willfully disable security. Unfortunately, this is not uncommon to see. I was contacted of the weekend by a security researcher, Ken Pyle of DFDR Consulting LLC, who notified me that he's run into a lot of sites with this problem and he provided a number of links. To be clear: Pages like this have a very obvious message that tells you what the problem is, namely that the page is not secured, so a lot of this is shoot yourself in the foot syndrome where somebody has willfully ignored the message or worse removed the associated security that gets put in place if you use the Web Connection tooling to configure a Web site. 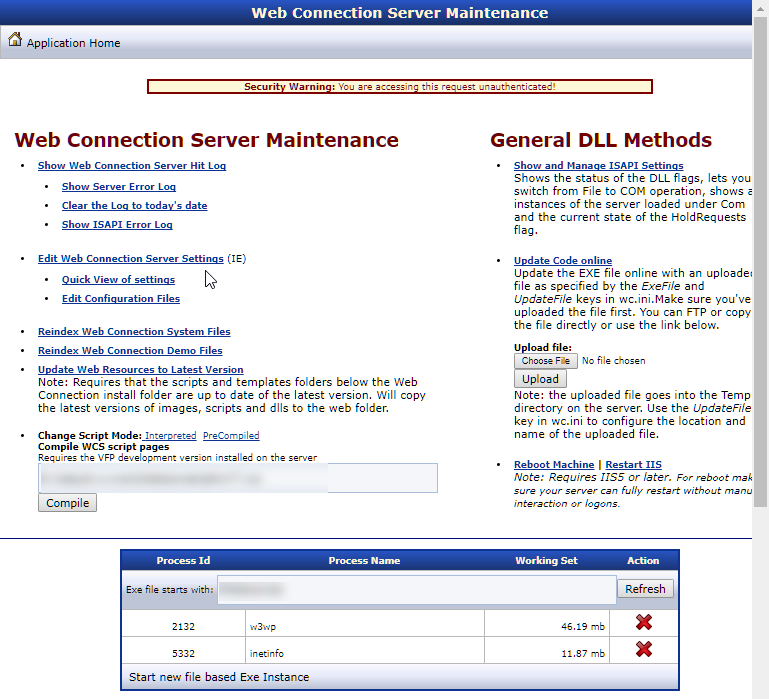 If you install Web Connection properly either following the manual configuration guide or using the automated tools (yourApp_ConfigureServer.prg or Console Web Site Configuration Wizard in older versions) the installation will be locked down, by removing anonymous access for the IUSR_ and Users account, so that at least a login of some sort is required to get to the admin page. In Web Connection v6.19 we've made some additional simple changes to the Admin page that make it much harder to accidentally expose the admin interface on a public Web site. If you do authenticate and get in the Process list shown in the previous screen shot is no longer available. Most of that functionality has been available in the Module Administration Page more specifically focused on the running application server instances. Regardless of this 'safe by default fix', it's extremely important that you lock down this page by explicitly removing access rights for non-authenticated users. In this post I'll show you how to do this as a refresher, but I also recommend you look at the documentation for Securing your Web Connection Installation. The Admin Page is really mostly a list of links, that points at Web Connection Server operations to manage the server lifetime. These links are also security sensitive obviously. But Web Connection administration requests like ReleaseComServers.wc or wc.wc?__maintain~ReleaseComServers are already locked down by default via the AdminAccount configuration setting in web.config or wc.ini with by default is set to ANY which means it requires any authenticated and refuses access by non-authenticated users. So these links are locked out by default, although - just like the Admin page - they can be unset and opened up. Don't do it - don't be the shoot-yourself-in-the-foot guy that unsets the setting and forgets to put it back. Always leave at least the base security in place. The biggest problem that causes the security issue is that IIS and Windows security isn't set up properly by the servers in question. If you use the Web Connection configuration tooling it automatically does the right thing and has always been doing so. 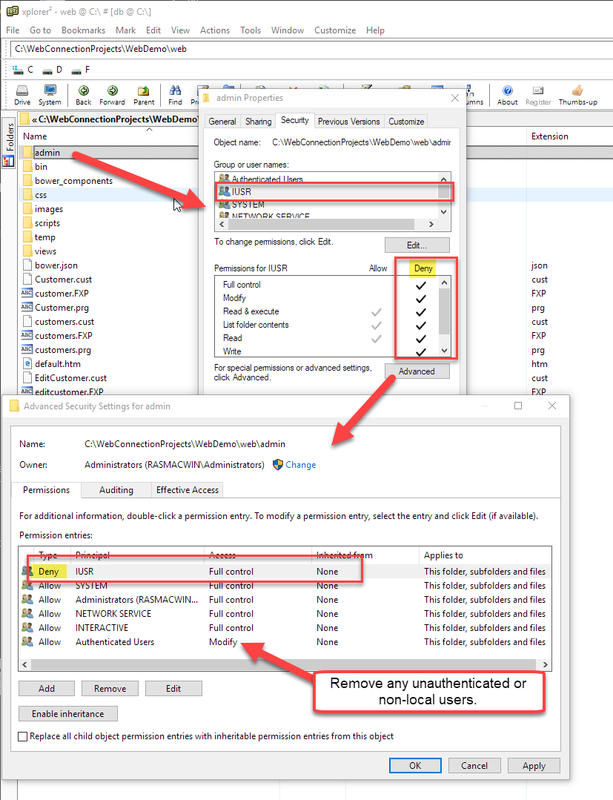 While the new Admin page fixes the basic issue of allowing access to the Admin page, it's still important to revoke access to the entire Admin folder for all unauthenticated users. Doing this alone will prevent access, but this is an explicit step. The new Admin page addresses the issue if you forget to set security, but it's still strongly recommended you remove IUSR! Let's do these steps manually. You can replace the section that shows the warning dialog in Admin.aspx with the following updated code that adds an additional remote site check and ends the response if the local and remote ips don't line up. <b>Security Warning:</b> You are accessing this request unauthenticated! You should enable authentication and remove anonymous access to this page or folder. You are not allowed to access this page without authentication from a remote address. local machine, but it won't work from a remote machine. The Machine Process List is a relic of earlier versions of Web Connection when the management features were less fleshed out. Today's Web Connection can perform these tasks much cleaner using the Module Administration page. Remove the Process List table and edit form from Admin.asxp (and in a similar way in Admin.asp). Also remove the block of script code on the bottom of the Admin.aspx page, which was used for helper purposes to the process list table above. If you're already on Web Connection 6.0 I highly recommend you update a version of 6.19 or later and copy the Admin.aspx page from the \templates\ProjectTemplate\Web\Admin folder into your Web Application(s). I can't overstate this: Even if you have an application that's been running for a long time, it's a good idea to keep up with versions in order to take advantage of security updates and bug fixes. There are many feature improvements in newer version, but being current also means it's much easier to update to later versions. Web Connection's core engine hasn't drastically changed since Version 5.0 more than 10 years ago, so updates are almost always drop in replacements - there are only a handful of documented breaking changes. Being on a recent version provides the ability to update to the most recent versions makes it much easier to keep up with changes and fixes, and you can use the changelog to see what's updating and what's being fixed with important and breaking changes highlighted. Nevertheless, I'll discuss the fix below, so if you're using a pre-6.x version of Web Connection you can manually update your Admin.aspx and the pre-6.0 Admin.asp pages. I want to also thank Ken Pyle for bringing this issue to my renewed attention and providing the motivation for updating the default implementation to reject unauthenticated access from remote sources by default.